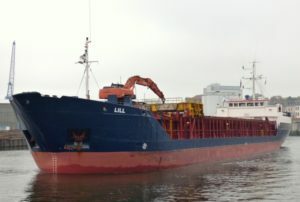 Yves le Blevec, who began an attempt on November 24th, to break the solo non-stop westabout round on the 31m Nigel Irens designed Actual Ultim (formerly Sodebo), capsized today off Cape Horn. 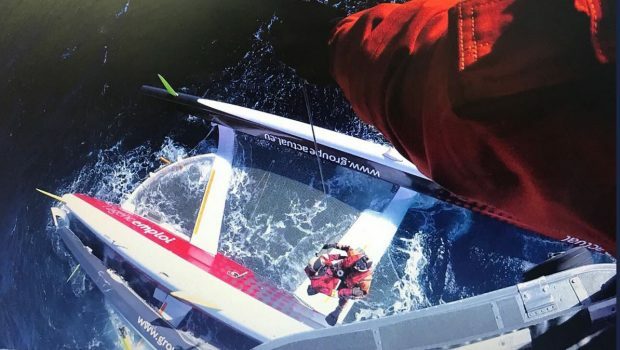 The early morning incident off the tip of South America came when one of the trimaran’s port linkages broke in west-northwest wind of 30 to 40 knots with 5 to 6-meter waves. He was able to get safely inside the boat and was rescued in the afternoon by the Chilean Coast Guard. The record he sought to break was set in 2004 by Jean Luc Van Den Heede who completed the route in 122d 14h 3m 49s on an 85-foot monohull.